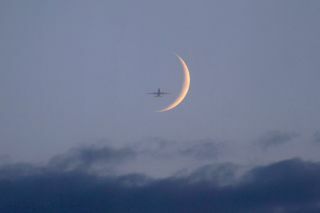 A plane appears to cruise by a stunning crescent moon in this skywatching image. This photo was taken by photographer Vegastar Carpentier of Paris, France, on May 22, 2012. He used an EOS Canon 1000D camera with 300mm x2 zoom lens and an exposure of Exp.1/50 seconds. An airplane greets a beautiful crescent moon in this dazzling night sky snapshot. Photographer Vegastar Carpentier took advantage of this stunning surprise from Paris, France on the evening of May 22, 2012. Carpentier used an EOS Canon 1000D camera with 300mm x2 zoom lens and an exposure of Exp.1/50 seconds with 12.8% of lunar illumination to take this photo.